A group of Elks scholars walked into the Biloxi Visitors Center. What happened next was no joke. They were greeted by an eager employee whose face promptly lit up on learning that they were Elks scholars in town for a service trip. He quickly ushered them outside to the lighthouse, Biloxi’s most recognizable landmark, and offered to take them to the top for free. The lighthouse was closed, but like the scholarships we provide, the Elks name opens doors. 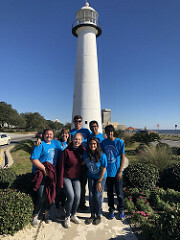 Nineteen Elks scholars from across the country converged on the Mississippi Gulf Coast for the Winter Service Trip. They had one mission: to learn, serve and connect in the name of the Elks. 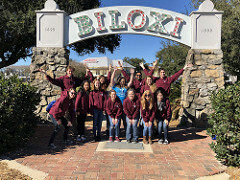 The scholars accomplished that mission on the bayous, where they removed invasive species, picked up trash, and stared down alligators; at the Moore Community House and Boys and Girls Club, where they played games with children of all ages; and in the V.A.’s Community Learning Center, where they delivered care packages and traded stories with veterans. Everywhere they went, the scholars made the kind of difference for which the Elks are known in the community; the kind of difference that opens doors. The scholars also had a few opportunities to connect with their Elks family. They attended three different Elks Lodges. At Gulfport Lodge No. 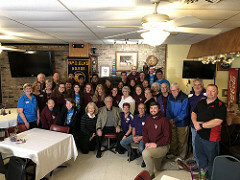 978, they ate red beans and rice, a Monday night staple in the South, and packed 100 hygiene kits to deliver to veterans the next day with the Lodge. At Ocean Springs Lodge No. 2501, they ate tacos and butchered their favorite songs at the Lodge’s karaoke night. And at Biloxi Lodge No. 606, they added new pins to the Lodge’s visitor map and talked about the doors opened by their Elks scholarships. Listening to a veteran’s story, singing karaoke with new friends, coming within in a few feet of an alligator—the scholars left Mississippi with special memories and a deeper understanding of why the name Elks is so powerful.